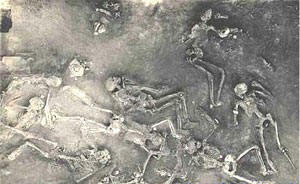 And these skeletons are thousands of years old, even by traditional archaeological standards. What could cause such a thing? Why did the bodies not decay or get eaten by wild animals? Furthermore, there is no apparent cause of a physically violent death. These skeletons are among the most radioactive ever found, on par with those at Hiroshima and Nagasaki. At one site, Soviet scholars found a skeleton which had a radioactive level 50 times greater than normal. Other cities have been found in northern India that show indications of explosions of great magnitude. One such city, found between the Ganges and the mountains of Rajmahal, seems to have been subjected to intense heat. Huge masses of walls and foundations of the ancient city are fused together, literally vitrified! And since there is no indication of a volcanic eruption at Mohenjo-Daro or at the other cities, the intense heat to melt clay vessels can only be explained by an atomic blast or some other unknown weapon. The cities were wiped out entirely. The Mammoth Trumpet, 16:9, March 2001. Cr. C. Davant III. This off-mainstream journal is published by the Center for the Study of the First Americans, 355 Weniger Hall, Oregon State University, Corvallis, OR 97331-6510. The second author (WT) is a consultant. The authors' credentials seem so good that we must take a close look at their extraordinary claims concerning a natural phenomenon that they believe reset radiocarbon clocks in north-central North America and - potentially - elsewhere on the planet. In the authors' words: Our research indicates that the entire Great Lakes region (and beyond) was subjected to particle bombardment and a catastrophic nuclear irradiation that produced secondary thermal neutrons from cosmic ray interactions. The neutrons produced unusually large quantities of ^239 Pu and substantially altered the natural uranium abundances (^235 U/^238 U) in artifacts and in other exposed materials including cherts, sediments, and the entire landscape. These neutrons necessarily transmuted residual nitrogen (^ N) in the dated charcoals to radiocarbon, thus explaining anomalous dates. Some North American dates may in consequence be as much as 10,000 years too young. So, we are not dealing with a trivial phenomenon! The authors claim that the burst of radiation from a nearby supernova, circa 12,500 years ago, not only reset radiocarbon clocks but also heated the planet's atmosphere, melted ice sheets, and led to biological extinctions. If verified, the claimed phenomenon would also "reset" archeological models of the settlement of North and South America. To illustrate, we may have to add as many as 10,000 years to site dates in much of North America! A heavy layer of radioactive ash in Rajasthan, India, covers a three-square mile area, ten miles west of Jodhpur. Scientists are investigating the site, where a housing development was being built. For some time it has been established that there is a very high rate of birth defects and cancer in the area under construction. The levels of radiation there have registered so high on investigators' gauges that the Indian government has now cordoned off the region. Construction has halted while the five member team conducts the investigation. The foreman of the project is Lee Hundley, who pioneered the investigation after the high level of radiation was discovered.